Wang Xin, a professor with Shaanxi Normal University, says Buddhism influenced the Tuyugou area deeply, and the Al-Sahab Kahfi Mazar was probably built on the ruins of a Buddhist temple after Islam replaced Buddhism in the area. 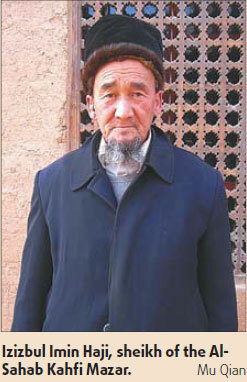 Wang believes that elements of more religions can be found in Tuyugou, for Xinjiang's location the Silk Road made it a meeting point of different religions and cultures. For example, the Nestorianism sect of Christianity used to be popular in the Turpan area and Nestorianism's idea of resurrection may have influenced the construction of the story of Al-Sahab Kahfi Mazar; the custom of using the stick to cure diseases is probably a remnant of Shamanism. In addition, the legend of the dog may be related to the ancient wolf totem of the Uygur people. The various cultural undercurrents of Tuyugou may not be evident to most worshippers at the Al-Sahab Kahfi Mazar who come here simply to seek divine blessings. Most worshippers come from May to October every year. Infertile women often come to worship at the Al-Sahab Kahfi Mazar in the hope of becoming pregnant. Those who succeed come back to offer their gratitude with an offering like a sheep and divide the meat among the villagers. But in a sign of changing times, "some women come to worship once a week, for seven consecutive weeks. If they still don't become pregnant, they go to a hospital," says Ziwithan.